ListPro® is the ultimate list-making toolkit. ListPro gives you everything you need to craft the perfect list. With ListPro's robust set of features, including an optional desktop version, you can build lists ranging from simple checklists to micro-databases. 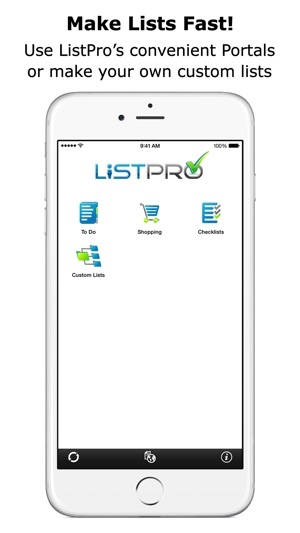 Get ListPro today and become a list pro! ListPro Doesn't Limit Your Creativity! ListPro gives you the tools and flexibility to build the lists you need. Don't get hemmed in by one-trick pony listmakers. With over 40 fully-customizable templates, 7 column types, item indenting, and a host of other list-making tools, ListPro lets you craft the list you need. Optional Windows Desktop Version Available! 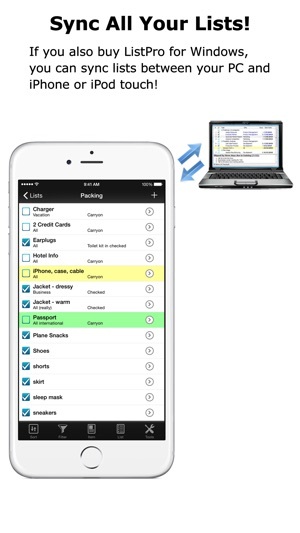 With ListPro you can create any list you want, anywhere. Add ListPro on Windows PC for just $19.95 and you can build lists on your computer as well as your device - whichever works best for you. 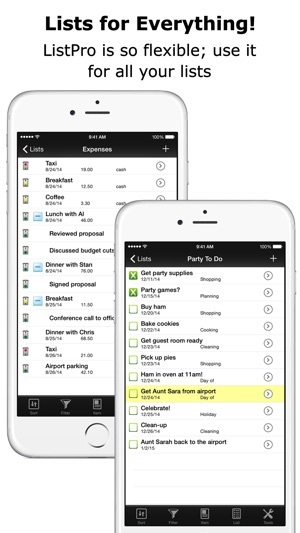 Make your lists just how you want them, quickly and easily. Plus, sync lists via WiFi between your desktop and your device to make your lists mobile and keep them up-to-date wherever you are. If you need some help getting started, choose from hundreds of user-constructed lists and templates at the List Exchange. Shopping lists, Getting Things Done templates, academic study guides, medical information, and more are just a click away. Winner of multiple mobile computing awards, ListPro has been the preferred choice for serious listmakers for over 17 years. Get ListPro today, and find out why ListPro remains the standard for people who are serious about their lists. I've been using ListPro for many years (all the way back to PocketPC days). 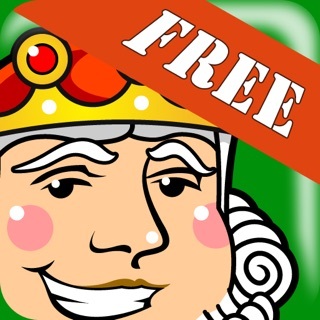 I use the desktop version and I decided to finally get the iPhone app. As with other reviewers, the wifi synching did not work for me and you can't use iTunes to transfer files. Fortunately, I was able to email myself the CLF files and then use the "Copy in ListPro" function to import them into the app. I'm so happy about being able to do that! The app itself is cumbersome and not intuitive, but I really needed it only to view my files, so I'm ok with it. 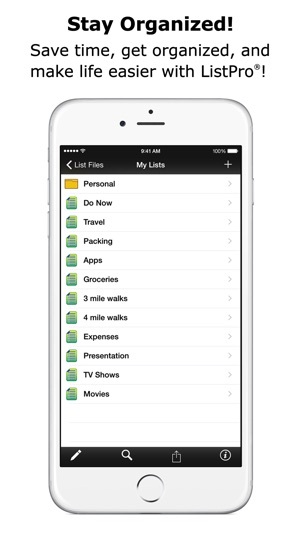 Anyway, I hope the developer continues to work on improving this powerful database list app because ListPro has helped many people stay organized. Thank you! Best List Program! Syncs w Desktop! Love this list program. I have used it on my PC for many years and am so happy that I can now sync it onto my phone. I use it to make lists of wines I want try, movies to see, books to read, gift ideas, personal goals, restaurants to try, sights to see, etc., etc. I have a permanent packing list. Before I travel, I check off the items and then clear the checkmarks so it's ready to use on the next trip. The ability to clear checkmarks is a great feature. Other feature I like: ability to flag certain items in a list and just display those. Cool! The main advatage of this program is that if you have many different ways of sorting your list, this can handle it. This also can hold many different lists or just one list. 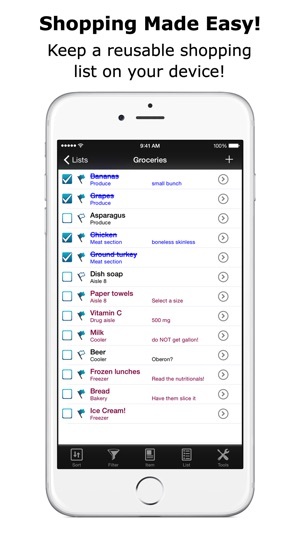 As a grocery list or a pack-for-trip list, this is excellent. It's well above average for a to do list. You can have many kinds of categories and amounts. The cons are that the due dates do not trigger alerts, there are only a few highlighting colors, and there is no horizontal mode. © 2010-2018 Ilium Software, Inc.